We find ourselves in the middle of the rolling hills of Illinois as we are on our way to the small town of Galena. 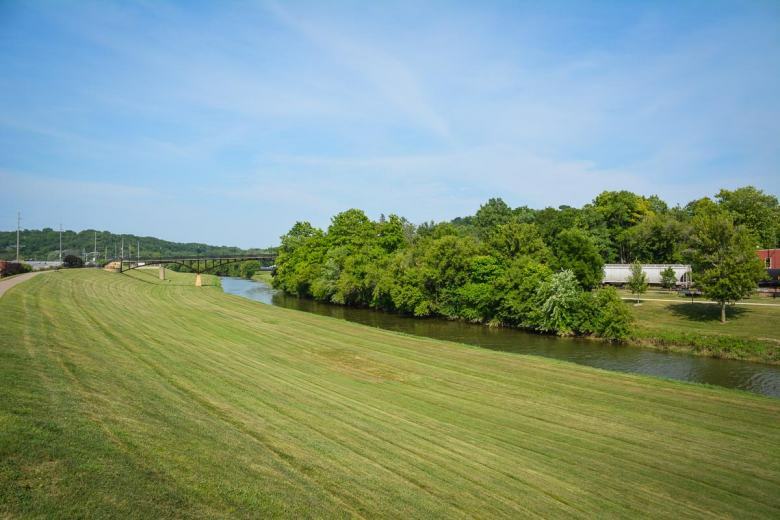 Our route takes us down the Great River Road which follows the Mississippi River through ten of the United States. 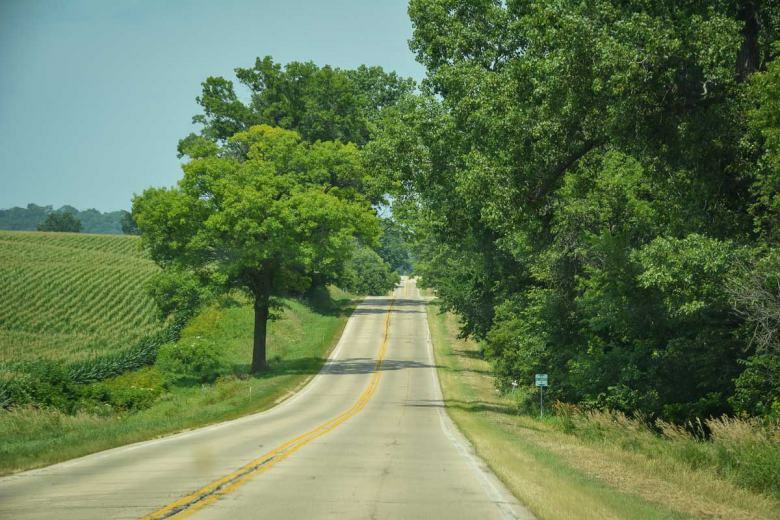 Our focus is the undiscovered countryside of Illinois, so lush and green and sunny. Everything seems rural and peaceful. Invited by the local tourism board, we are on a trip to find the true American Midwest. 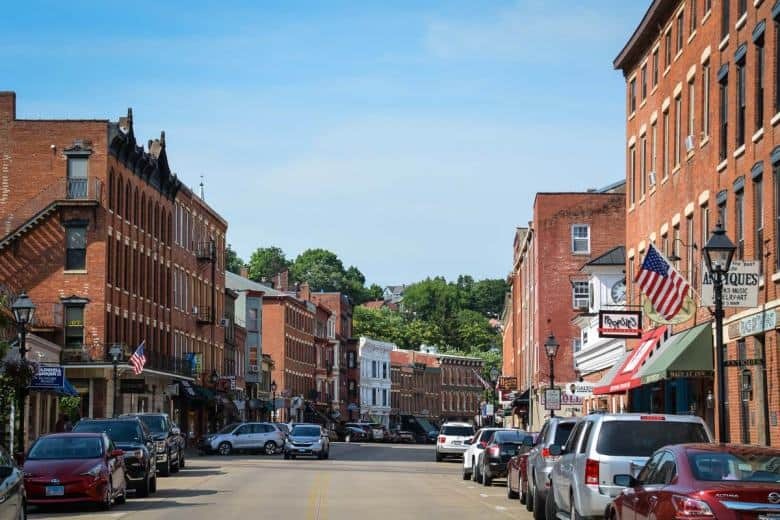 As we are soon to find out at our next stop, the historic town of Galena really is the best place to experience this unspoilt American Way of Life. The rolling hills of Illinois – soybean and corn are the main crops that are grown in this part of the US. Huge farms and small towns dominate this rural part of Illinois. The Great River Road is one of the great road trips you can drive in the United States. It follows the Mississippi River and connects the dots between the various riverside communities. Up here in Illinois, we drive past huge acres of farmland. Dark green fields of soybeans alternating with the golden hues of corn. The farms buildings all follow the same pattern: Big shiny silos, huge barns. We stand in front of a railway crossing, a freight train is passing through. The wait is two minutes, then four minutes, then five. We kill the engine, listen to the songs of the birds as the endless train passes through. Yes, we slow down and enjoy the moment. This part of Illinois is a country of stretched out communities, where everything seems oversized and there is no lack of space. The houses in the small towns are built from timber. They have wide open porches with rocking chairs, American flags proudly displayed in the frontyards. The streets are empty, traffic jams are unheard of. Rarely do we see people in this mid-summer heat, just older men riding their lawnmowers under the watchful eye of circling birds of prey. This is the Belvedere Mansion, a grand mansion that sets the tone as you enter the town of Galena. Finally, we arrive in Galena. 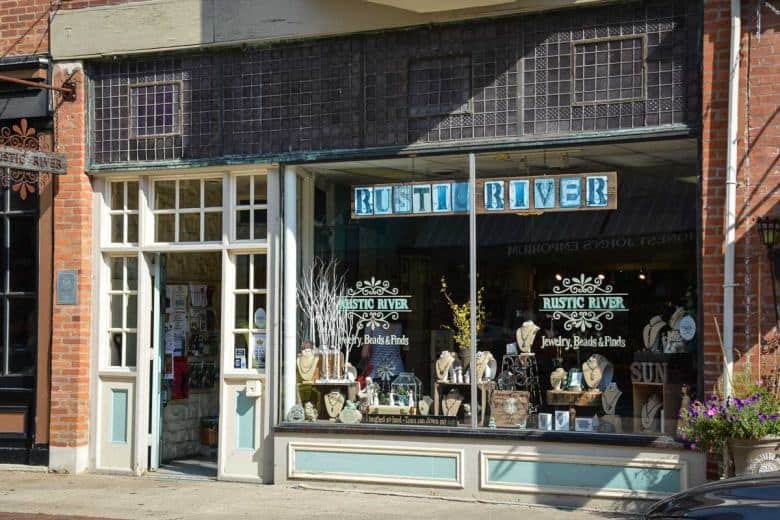 The historic mining town is small and pretty and is right on the Galena River. Stately homes in Italianate style such as the Belvedere Mansion overlook the river, reminiscent of the Civil War era. White columns, a lookout tower on top, flowering gardens. 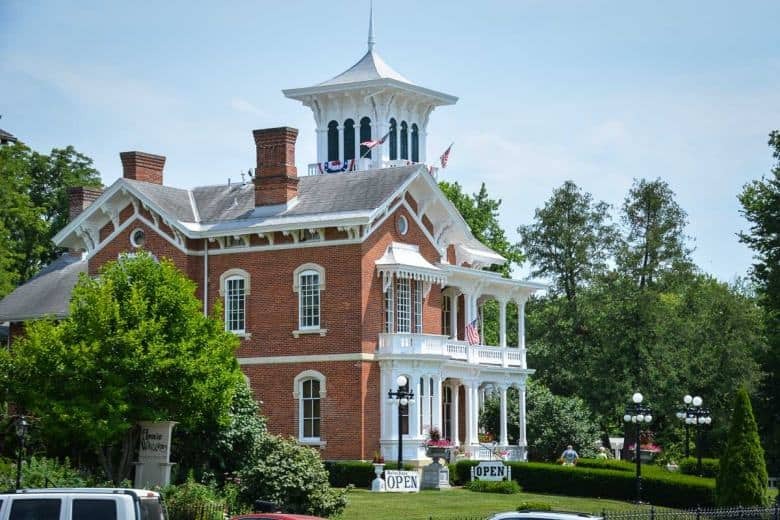 Ex-President Ulysses S. Grant lived in this town after leading a successful campaign during the Civil War. The General’s house can be visited today and is one of the major tourist attractions. We cross a bridge and as we pass through the iron floodgates, we enter a world of red brick and faded billboards. 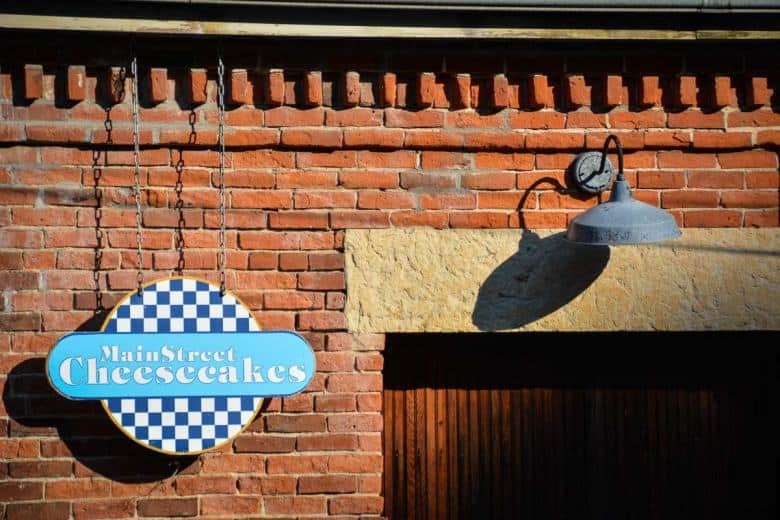 Main Street is the beating heart of Galena and a popular weekend trip destination for visitors from Chicago. We park the car and take a stroll. A trolley rumbles down the street, taking visitors for a ride, but we choose a slower pace to soak up the atmosphere. Window shopping is delightful in Galena. Jewellery and homewares, fashion and delicatessen, Galena’s businesses offer quality and style. A lot of the original flavour of the town is still easy to take in: Small details reveal the glorious past of Galena back when lead ore mining in the area was still profitable. 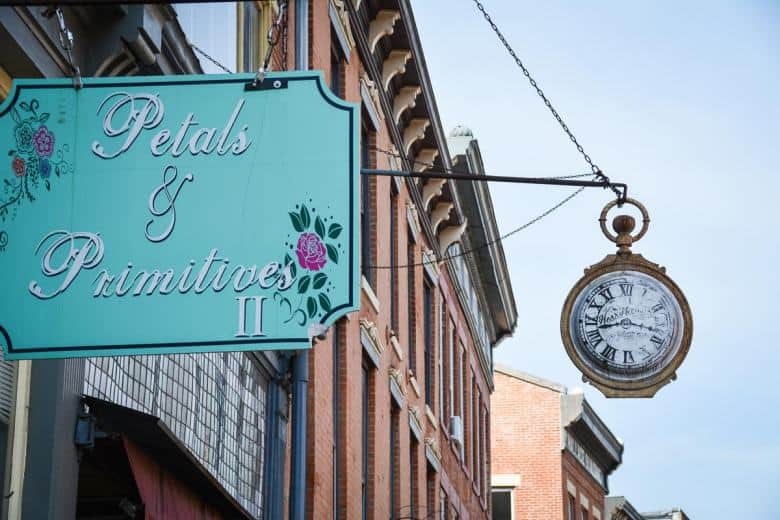 Galena’s historic Main Street is a tourist magnet in the region, and rightly so. There is no better place to feel the nostalgic charm of the Mississippi region. We find a seat at a restaurant on Main Street, Fried Green Tomatoes, mainly because I like the name. I always wanted to try the dish, ever since I had seen the movie of that name. We order a plate and study the details of the dining room while we are waiting. Exposed brick walls, old-fashioned lamps, a tin tile ceiling. The rooms have a distinct vintage feel to them so that I feel compelled to ask about the history of the building. As the hostess explains, the building was once owned by General Grant’s father who ran a leather factory in Galena. Later, it was used as a drug store, then as an antique store – a colourful past with lots of twists and turns. The fried green tomatoes, prepared Italian style with a rich tomato sauce, are delicious. There is a hint of local vodka added to the sauce, distilled right here in Galena at Blaum Bros. Incidentally, this is our next stop, to take part in a tour of the distillery. Blaum Bros is a young business just outside of Galena which has big plans to produce some of the best whiskeys and spirits in the US. Their good sense of humour is legendary already. For Connoisseurs: Blaum Bros Distilling Co. 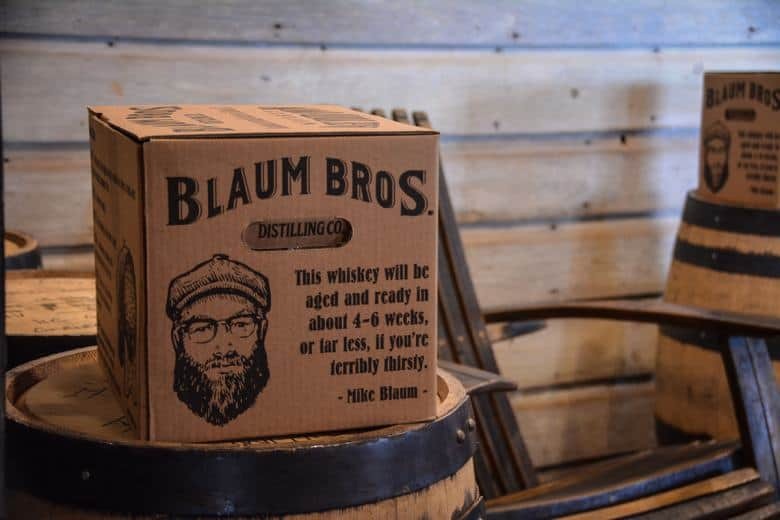 The Blaum brothers opened up a distillery just outside of Galena in 2013. Here they produce fine American whiskey and other spirits, mostly gin and vodka. They claim that there is not much they can agree on as brothers, but these products unite them. Visitors can take part in daily tours to learn more about the business and the various products, something I would strongly recommend you should join when in the area. On this tour, we learn a lot about the processes of distilling. 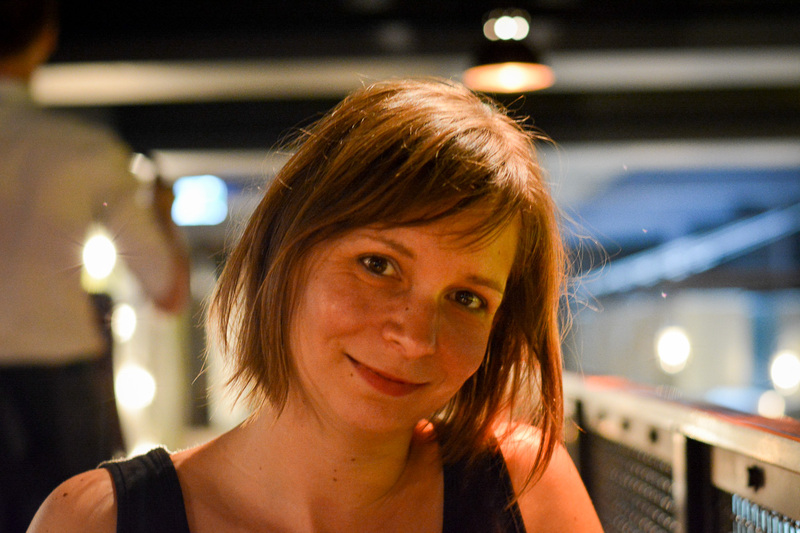 We learn what to look out for in a good product. There are rare glimpses behind the scenes to see the machines. In the store rooms dozens of barrels sit under the watchful eye of the brothers collecting dust. It is a fun experience with lots of anecdotes and cheeky details, and in the end we get to taste some of the wonderful spirits that Blaum Bros sell right here and there in the store. As relaxed as we felt that afternoon, the tenser we would be the next morning. 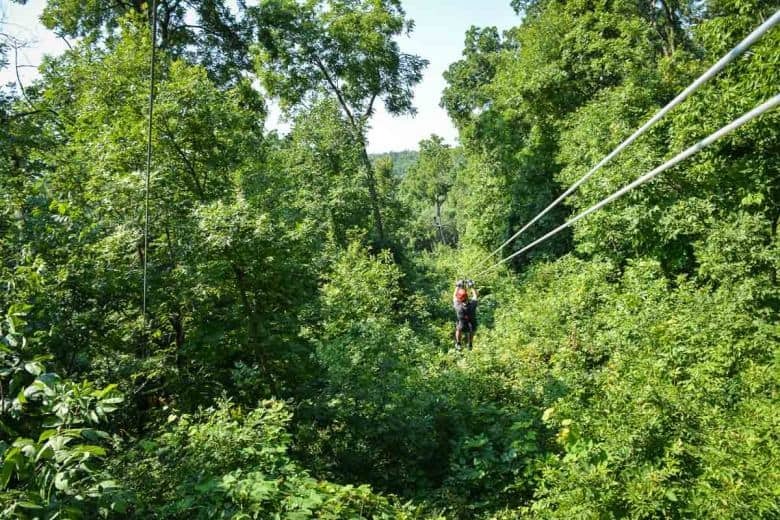 We are to try out another one of Galena’s attractions: Long Hollow Canopy Tours. Zip-lining in the Galena area is great fun for anyone over 10 years of age. I have never done ziplining before, and even though I am not exactly an adventurous person I have no qualms about climbing up three or four metre high platforms and zipping through the canopy of a forest. Once you understand the basic mechanics and you know how to get started, things roll along easily. But of course, it is not that easy. You see, getting up is one thing at Long Hollow Canopy Tours. Getting down is another. Two guides take our small group along the track and ensure that we are safe and happy. After a short training on the floor we are ready to go. The track increases in difficulty as we move forward, with lines getting longer and higher up in the air with each new section. Eventually, we reach a length of around 360 metres which we speed down with incredible 80 km/h. It’s great fun, an unforgettable experience. 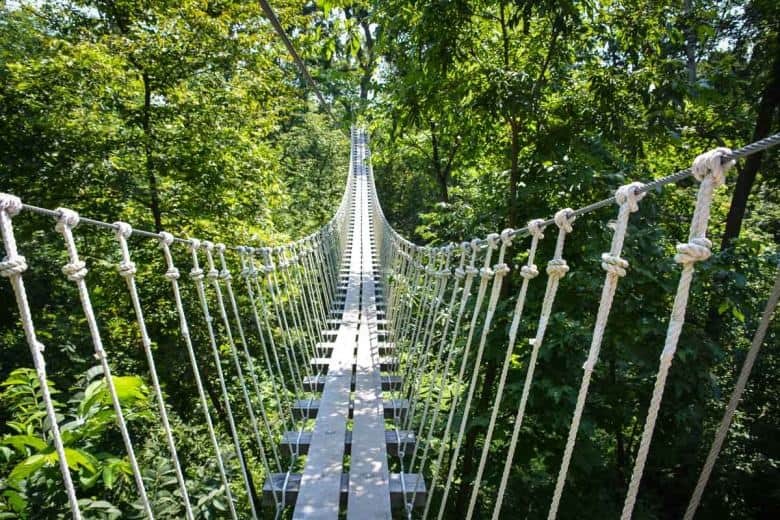 The suspended bridge is part of the zip lining experience at Long Hollows. If you are scared of heights, you may find this part slightly challenging although it is very safe. All around us, the forest is alive. I smell the vanilla scent of the spray that is keeping the bugs away as my eyes wander across the countryside. There are waiting times as the other team members prepare to go down the line. Plenty of opportunity to check for wildlife in the woods. The fun part ends with the last stop back at base. We are given the choice between a quick fall to get down or the more complicated repelling option. Even though it scares us beyond belief we don’t want to slow down the group. We go for the scary option of free falling down the platform. I have before never known fear until I reach this critical point in my life! But in the end I unelegantly land on my bum (the guide doesn’t get there quickly enough to catch me). Just like this, all fear is forgotten. In fact, I am even a little bit proud of myself! 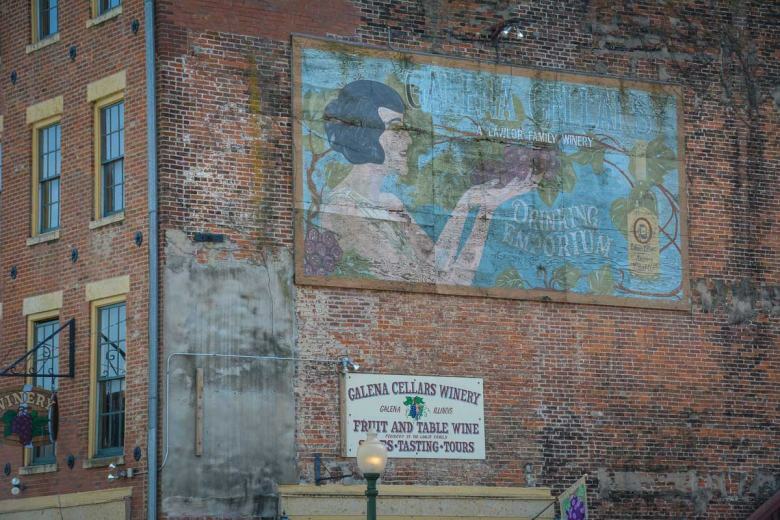 Faded billboards on red brick walls – this is how Galena keeps the spirit of days gone by alive. 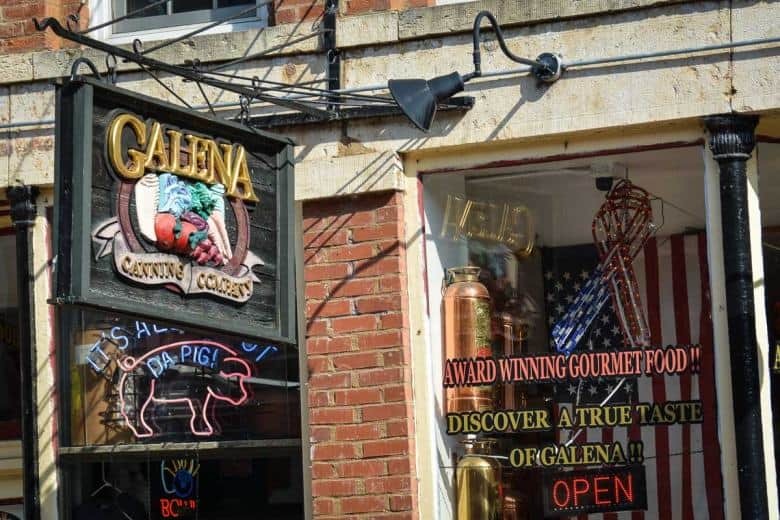 After tasting the great gins and whiskey, walking down main street, and getting too much adrenaline pumped through my system, I can now say that Galena is definitely one of the highlights of our road trip on the Great River Road in Illinois. The town is so cute and has so much to offer, we could easily picture ourselves staying there for a couple of days. Just to explore more of the various attractions and soak up more of that charming atmosphere. I heard that there is also great skiing in the mountains, which must be so much fun when visiting Galena in winter. 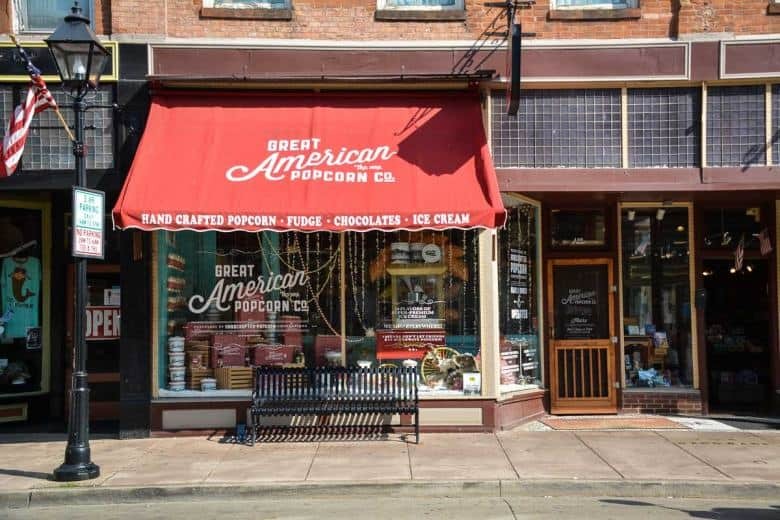 Vintage shops, delicatessens and gourmet restaurants line the Main Street of Galena. No wonder it’s a popular weekend getaway for visitors from Chicago and other cities. 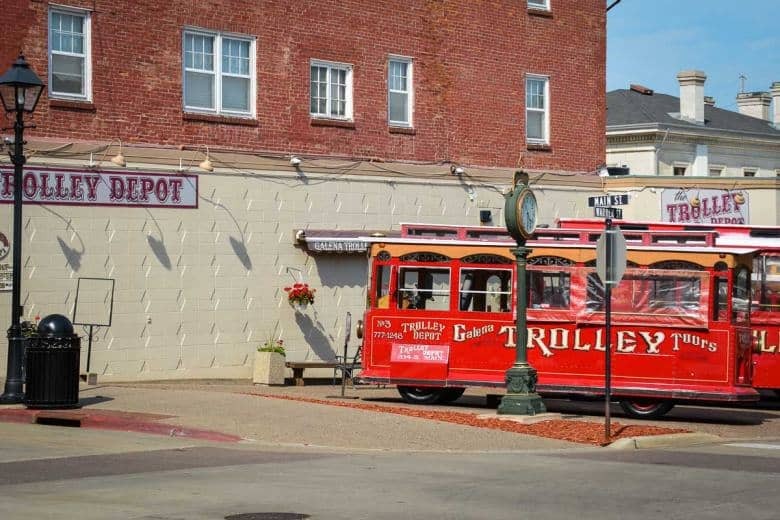 These trolleys take you for a tour of the town when you are in Galena. They look like good fun and must be great when visiting with children. Many houses in Galena still retain original features, adding style and flair to the shopping experience. A typical sight in this old mining town. Galena used to be a thriving centre for lead ore mining. After years of decline, tourism has brought back fresh life to the old Main Street. 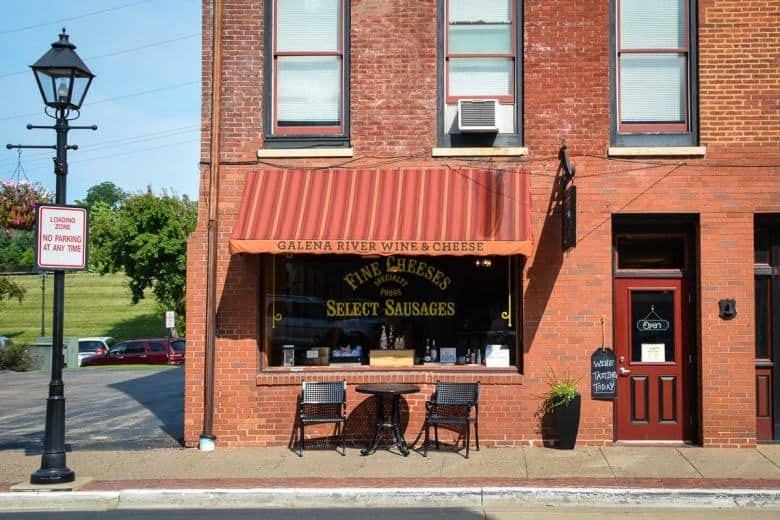 Business owners in Galena ensure that quality and style fit the overall experience for shoppers in Galena. 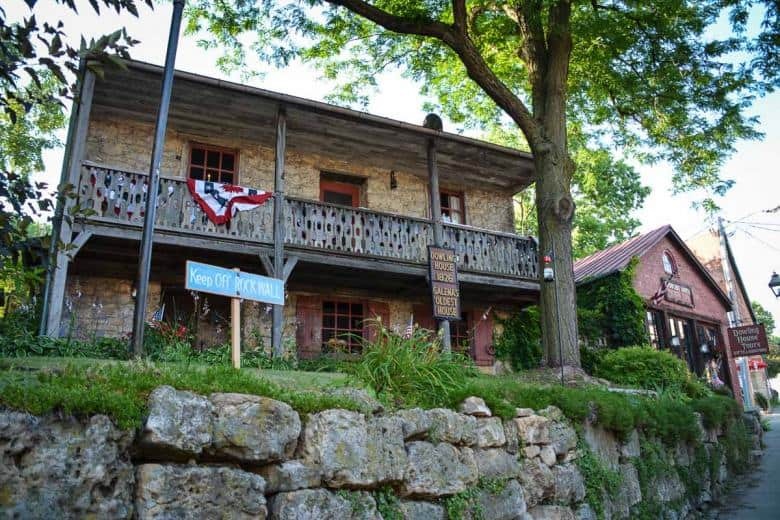 This is Dowling House, the oldest house in Galena, built in 1826. It can be visited in summer. 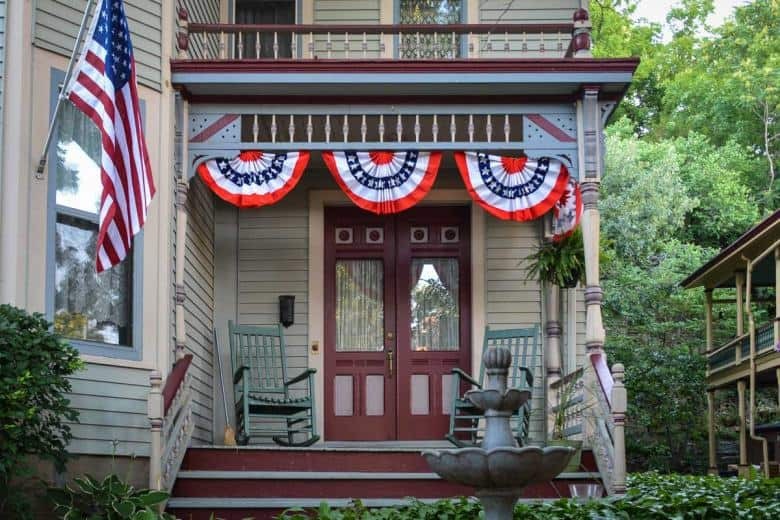 Since we visited just after July 4 most houses in Galena were still decorated in patriotic colours. Galena is on the Galena River. A dyke and floodgates protect the town from major disaster. 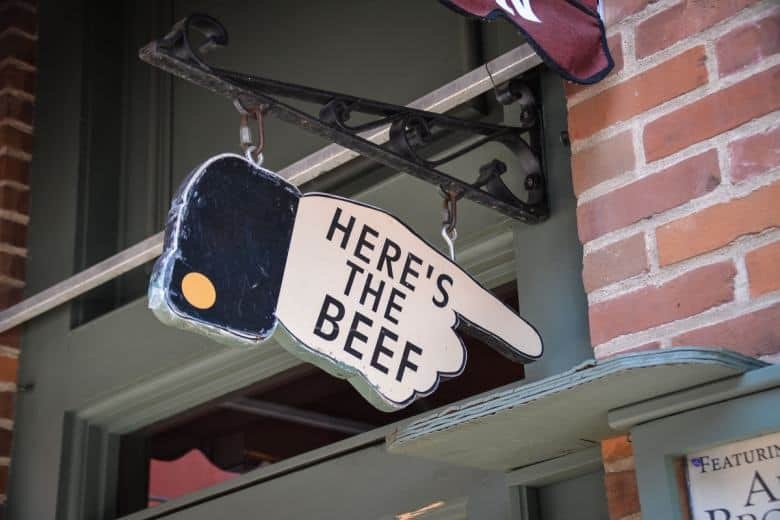 I just love how well these things go together – seen on a Galena building.